where . Note that the motion is clearly periodic in time, with period . Thus, the particle must trace out some closed trajectory in the - plane. The question, now, is what does this trajectory look like as a function of the relative phase-shift, , between the oscillations in the - and -directions? Unfortunately, the above equation is not immediately recognizable as being the equation of any particular geometric curve: e.g., a circle, an ellipse, or a parabola, etc. Of course, we immediately recognize Equation (172) as the equation of an ellipse, centered on the origin, whose major and minor axes are aligned along the - and -axes, and whose major and minor radii are and , respectively (assuming that ). We conclude that, in general, a particle of mass moving in the two-dimensional harmonic potential (154) executes a closed elliptical orbit (which is not necessarily aligned along the - and -axes), centered on the origin, with period , where . 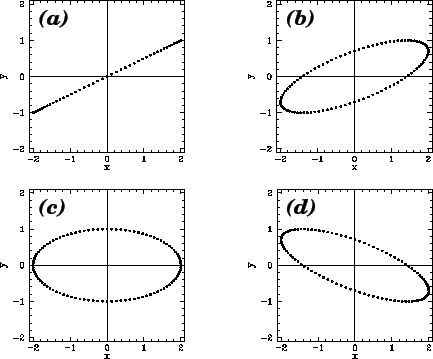 Figure 10: Trajectories in a two-dimensional harmonic oscillator potential. Figure 10 shows some example trajectories calculated for , , and the following values of the phase difference, : (a) ; (b) ; (c) ; (d) . Note that when the trajectory degenerates into a straight-line (which can be thought of as an ellipse whose minor radius is zero). Perhaps, the main lesson to be learned from the above study of two-dimensional motion in a harmonic potential is that comparatively simple patterns of motion can be made to look complicated when expressed in terms of ill-chosen coordinates.